Hey, wait a minute! Isn’t Superman supposed to be dead?! Well…yes and no. If you’ve been following DC’s Rebirth line, it's been common knowledge that the Man of Steel is no more: gone super-nova and then, nothing. Superwomen have risen in his stead to protect Metropolis as have several new incarnations of supermen, all wearing the iconic “S”, across their chests. Just as it happened way back in 1992’s storyline, The Death of Superman in Superman #75. It too, was written by the familiar Dan Jurgens, who continues to do so here in the current tale. The difference? One of these men claims he is The Superman (I know, just as most did then too!) and without his alter- ego, Clark Kent (who by the way, is in Metropolis as well!). I must admit: most of us are familiar of the original Superman and the artwork is reminiscent of the classic, but, with this new arc in the lore of Superman, it may take a little time to let it all sink in. In the conclusion of the “Path of Doom” storyline , the battle between Superman and Doomsday rages on. Wonder Woman guest stars and as in the last issue, is once again drawn into the mix of Superman with his foe, with some encouragement from Jon, the son of Superman and Lois(Whaaat?! Remember, this is Rebirth!). A mysterious stranger who observes from afar lends some mystery to the story. Who is he and what does he want with Doomsday? And what would a Superman comic be without an appearance by Lex Luthor?! There is some good interaction between Superman and Lex at the end as they survey the devastation wrought by the battle. They feel out each other as to who they are and what their motivations may be. Will they continue as foes or will they become allies? The Verdict: Writer Dan Jurgens is without a doubt the premiere writer of Superman going all the way back to his work he did on the title in the early 1990’s, having penned some of the great storylines in the comic and continues to do so today. 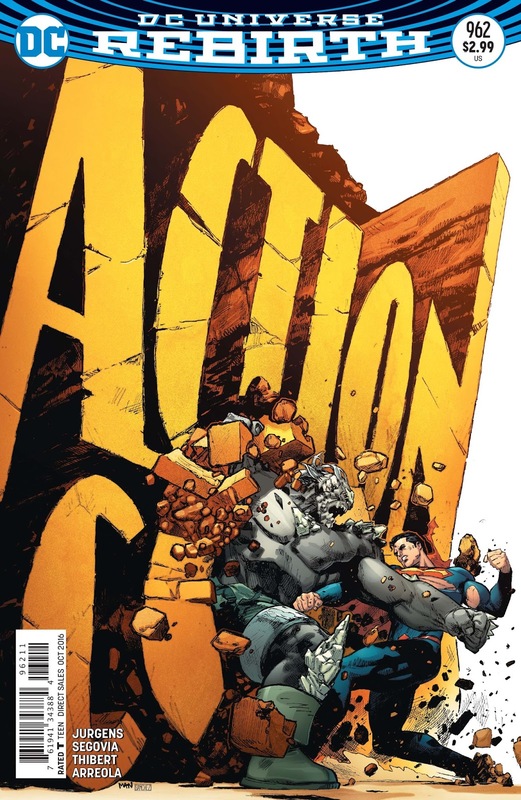 The artwork is top notch and is very worthy of one of DC’s flagship titles. It is interesting and exciting to see the changes and development of old characters in this new universe at DC.